One of six international airports serving Greater London, London Luton Airport is located to the north of the city. Our London Luton Airport guide includes contact information as well as details relating to terminal facilities, public transport routes and nearby accommodation options. Plans are in place to increase the number of passengers to 18 million from the current level of 10 million. As part of this plan, a new terminal pier will be constructed and new road links will be built within the airport site by the end of 2020. There are several electronic information booths within the terminal, as well as roving passenger service assistants. The booths contain touch-screen information on transportation, local amenities, airport facilities, parking and live flight times. From central London, follow the signs for 'M1 North' from the M1, exit at junction 10 and follow signs to the airport. From the east, take the A505 dual carriageway from junction 9 of the A1 – the A505 runs alongside the airport site via Hitchin. London Luton Airport is located 51km (32 miles) north of central London. Bus:Local bus services connect London Luton Airport with the surrounding areas – Stagecoach bus 99 links the airport to Luton and Milton Keynes. Bus tickets are available at the Onward Travel Centre in the main concourse. There are also regular services from London Luton Airport to Stansted, Heathrow and Gatwick airports. For further information, contact Traveline (tel: +44 871 200 2233; www.traveline.org.uk). Coach:The Greenline 757 express coach (tel: +44 844 801 7261; www.greenline.co.uk), Easybus (www.easybus.co.uk) and National Express (tel: +44 871 781 8178; www.nationalexpress.com) services link London Luton Airport to various destinations in central London; the journey takes about two hours and costs around £15 (depending on the provider). National Express coaches also operate to destinations throughout the country. Coach tickets are available from the Onward Travel Centre. Taxi:Alpha Taxis (tel: +44 1582 599 499; www.alphataxisluton.com), Cabco Taxis Luton (tel: +44 1582 737 777; www.lutoncabcotaxi.com) and Luton Taxi Association (tel: +44 1582 735 555) offer pre-bookable services to and from the airport, while licensed taxis are available at a rank outside the terminal. Fares to central London start at £70 and the journey is around 40 minutes, depending on the time of day and traffic conditions. Rail:Luton Airport Parkway Station, which is 2km (1 mile) from London Luton Airport, is connected to the terminal by a shuttle bus service (journey time: 10 minutes; fare: £1.60 [cash only]). Thameslink Railway (formerly First Capital Connect) (tel: +44 345 026 4700; www.thameslinkrailway.com) and East Midlands Trains (tel: +44 3457 125 678; www.eastmidlandstrains.co.uk) provide services to London (journey time to London: 20-30 minutes; fare: from £9). For further information on times and fares, call the 24-hour National Rail enquiries line (tel: +44 8457 484 950; www.nationalrail.co.uk). Virgin Trains (tel: +44 8719 774 222; www.virgintrains.co.uk) operates an express coach connection to its West Coast mainline rail services at Milton Keynes Station. ATMs can be found in the check-in area, in the departures area and at the Onwards Travel Centre. Bureaux de change facilities are also located throughout the terminal building. London Luton Airport has a range of restaurants, cafés and bars, including a food court area in Departures. There is a wide variety of shops at London Luton Airport, including 24-hour duty-free shopping (for passengers leaving the EU), designer clothing outlets and newsagents. A 'collect on return' service is available from the Aelia duty-free shop for those not wishing to take their purchases onboard. There is a left-luggage desk in the check-in area. Contact the lost property office (tel: +44 1582 395 219) for items lost or found within the airport. Luggage trolleys are available for a £2 fee. Other facilities at London Luton Airport include a children's play centre, baby care rooms and a chapel. The Servisair executive lounge (tel: +44 1582 700 898) in Departures offers complimentary drinks and snacks and a range of business facilities, including free Wi-Fi and mobile device charging points. For further business facilities and meeting rooms, passengers can head to the nearby Hotel London Luton Airport (tel: +44 1582 424 488; www.ibis.com). Public telephones, some of which are web-enabled, are located throughout the terminal. Wi-Fi is available at the airport, the first 30 minutes of which is free to use (£3 per hour after that). Postboxes can be found both pre- and post-security. London Luton Airport is fully accessible and includes dedicated toilets and lowered telephones, as well as induction loops for the hearing impaired. Disabled parking is also available (tel: +44 345 303 7397). Wheelchair and baggage assistance can be requested via the special assistance telephones located at various points within the terminal. Luton Airport Express shuttle buses are wheelchair-accessible. Any passengers who may require additional assistance are advised to contact their airline before travelling. 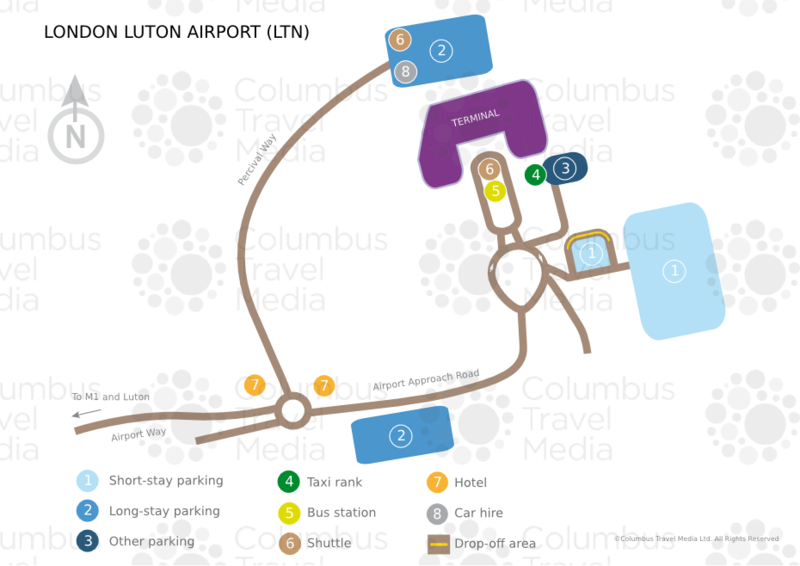 Short-, medium- and long-stay parking options are available at London Luton Airport. Short-term parking is within easy reach of the terminal building, while courtesy buses link the mid- and long-term car parks that are five to 10 minutes from the terminal building. Passengers can pre-book parking through the airport's website or via telephone (tel: +44 345 303 7397). Car hire companies located at London Luton Airport include: Alamo, Avis, Budget, Europcar, Hertz, National and Sixt. Free shuttle buses link the terminal with the car hire centre.